One of the prevalent trends we saw at Christmas was that we are not buying as much ‘stuff’… instead over the festive period we chose to spend more time with family and friends. This trend for getting together to celebrate special occasions has, in turn, had a positive impact on the sale of products we would previously have called ‘social stationery’ - which includes invitations, note cards, writing paper and envelopes and thank you cards. We are all looking for new sales opportunities that are relevant to our customers so as we head further into 2019, is this an area that would sell well for you, either as a card publisher who has a strong range of occasions cards or a retailer who stocks cards and gifts that relate to parties and celebrations? As with all card ranges, the more specific you make a design the more you limit its appeal so if you want a small range of invitation type products it is important to keep their appeal broad. Select a number of key target customer types and occasions and invitations with the right level of finish that will sell at price points you know your customers will like. There are lots of great ranges around that are appropriate for all sorts of customers and occasions from children to grandparents, christenings to significant birthdays and I would like to share with you some of my favourites. 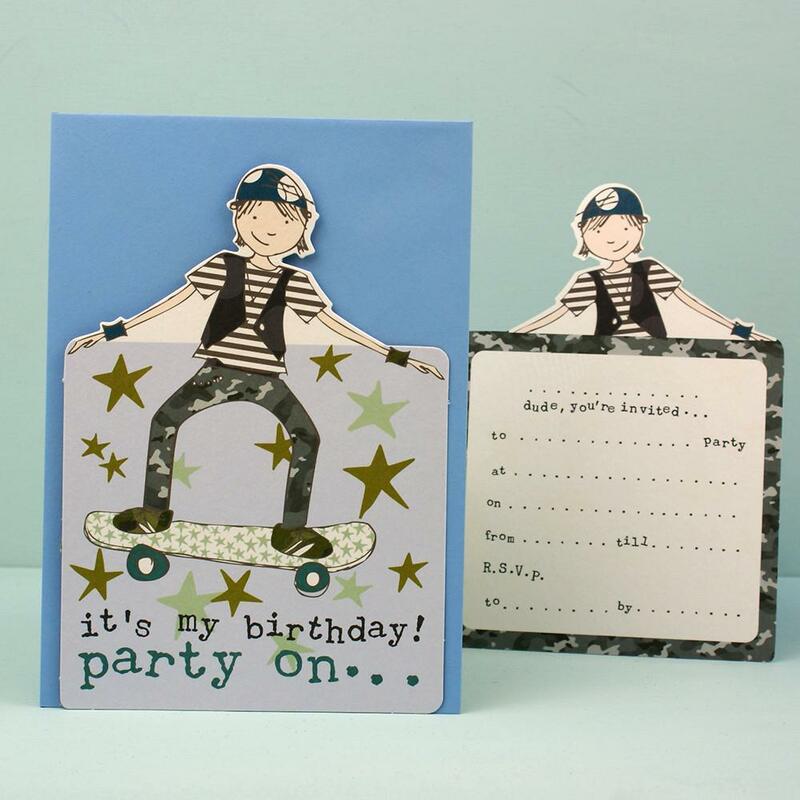 Children’s parties are a fun area particularly those for younger children and there are lots of fabulous children’s birthday cards and party invitations available . And there can be all sorts of reasons to send invitations; online retailer Dear Henry even has invitations for sleepovers and coming for tea!! Online is a popular source of all sorts of party paraphernalia and because space is less of an issue, online retailers can offer themed ranges allowing party organisers to buy co-ordinated ranges of items from one source. They are hard to beat on price but not everyone needs this breadth of product and as a retailer you certainly should not feel obliged to offer plate, napkins and all the trimmings. For grown ups, there are lots of options too: a simple, traditional style of invitation or thank you card will suit a lot of customers and there are plenty of lovely contemporary interpretations available - and humorous ones too! And it is not just from card publishers and stationers, gift suppliers like Ginger Ray are offering invitations too. Very formal or special occasions may justify a printed, personalised invitation and whereas 20 years ago you would have gone into a stationers and sat down and looked through books of styles to select what you wanted, now it is all done online either with a reputable retailer like John Lewis or with an online publisher who specialises in this area like Ivy Ellen the sister company to well known card publisher Blue Eyed Sun. And what about saying thank you be it for a present, an enjoyable party or evening together or after a bigger celebration and lots of presents? Older family members put a lot of store by receiving a thank you letter from a child for a Christmas or birthday gift. I remember when I was little being thrilled to have an excuse to use my new Platignum fountain pen so writing my thank you letters was always fun - and these days many retailers sell packs of thank you cards for children to do the same. And there are single cards for adults that are ideal for a brief note; one of the most popular examples on the market at the moment is the simple but eye catching card from Lagom whose message is Small Card Big Thank you. Older PostMerry Christmas and Best Wishes for 2019!